Last week I wrote about the 5 things you need to know about Credit Card Air Miles. This week I am going to share with you my secret recipe on the 6 ways you can maximise your Credit Cards’ Air Miles*. I often get asked what is the best way to earn the most number of Air Miles in a short span of time, mainly because I managed to redeem two air tickets to Barcelona in less than a year. *Similarly like last week, in this post we will be referring predominantly to Kris Flyer Air Miles as most of the credit cards in Singapore have a rewards programme for it (as compared to Asia Miles which have lesser rewards programmes). Give a shout out in the comments below if you are hoping for an article that targets other mileage programmes such as Asia Miles (used by Cathay Pacific Airways, British Airways, Qantas)! 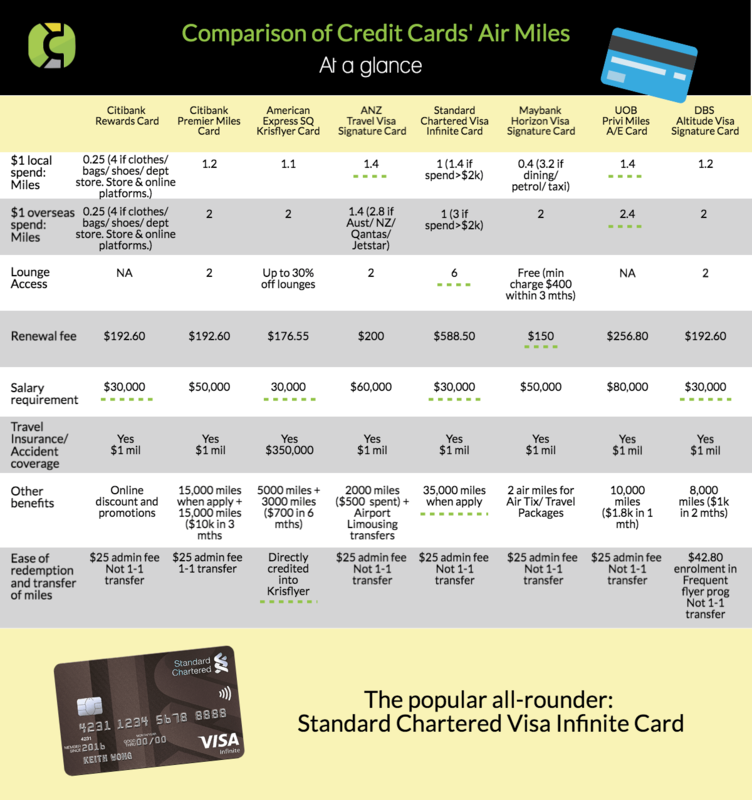 Before we embark on some serious analysis of credit card strategies, let us first compare the various air miles credit cards out there in Singapore. To do this, we have created a table that compares 8 credit cards ( American Express Krisflyer Credit Card, Citibank Rewards Card, Citibank Premier Miles Card, ANZ Travel Visa Signature Card, Standard Chartered Visa Infinite Card, Maybank Horizon Visa Signature Card, UOB Privi Miles American Express Card, DBS Altitude Visa Signature Card). Technically, if you look at the table above, the winner is Standard Chartered Visa Infinite Card. But what? 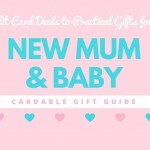 Read our article from last week. Did you read the fine print? Last week, we discussed how real life spending patterns often do not reflect that precise amount of air miles to be earned. In plain english: If you do not spend in multiples of 5, you will lose air miles in the conversion. On top of this, many credit card companies only allow you to convert your credit card points to air miles in fixed quantum of 5,000. The implication of this is that if in the scenario where you have 14,000 credit card points, only 10,000 credit card points will be converted and you lose 4,000 credit card points until you accumulate enough for the next point of redemption. That sounds like a tough way to live my life. To be frank, it is quite rare for people to spend precisely in such multiples. Hence for all you lucky people reading this, I have narrowed it down to 6 steps using 5 credit cards: American Express Krisflyer Credit Card, Citibank Rewards Card, ANZ Travel Visa Signature Card, Maybank Horizon Visa Signature Card and DBS Altitude Visa Signature Card. Sign up for American Express Krisflyer Credit Card and charge $700 in first six months to get 8000 miles (5000 miles for first charge and 3000 miles for any charge above $700 in first six months). For $1 local spend, I would use my ANZ Travel Visa Signature Card to get 1.4 miles. 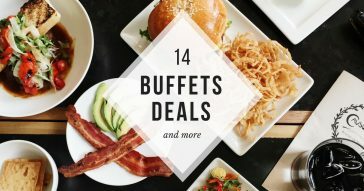 Standard Chartered Visa Infinite Card also awards 1.4 miles for every $1 local spend but only if you spend above $2000 in a month! Hence if you are not a monthly high spender, then you should use the ANZ Travel Visa Signature Card. For $1 overseas spend, I would use my American Express Krisflyer Credit Card to get 2 miles. Again, Standard Chartered Visa Infinite Card awards 3 miles for every $1 local spend but only if you spend above $2000 in a month! Hence if you are not a monthly high spender, then you should use the American Express Krisflyer Credit Card. For in-store and online shopping (for clothes, bags, shoes, department stores), I would use Citibank Rewards Card to get 4 air miles for every $1 spent. 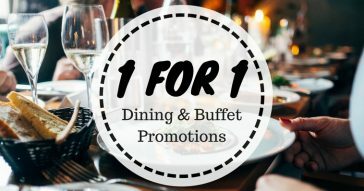 For spending on dining, petrol and taxis, I would use Maybank Horizon Visa Signature Card to earn 3.2 miles for every $1 spent (spend a minimum of $300 a month). This is subject to the Merchant Category Code which has to state that they are either Eating Places & Restaurants, Petrol Stations or Local Taxi Providers. 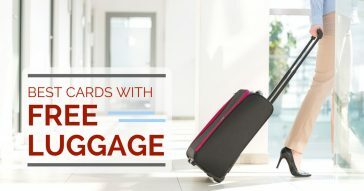 If I am a frequent flyer, for purchase of flight tickets such as Singapore Airlines, I would use DBS Altitude Visa Signature Card to get 3 miles for every $1 spent. 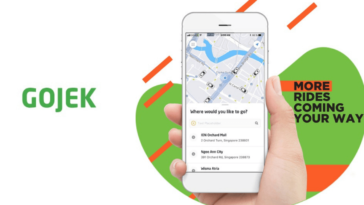 If I am a frequent user of Expedia.com (eg for Singapore Airlines or Silk Air flights) or kaligo.com, to get 6 miles and 10 miles respectively for every $1 spent, I would use either Citibank PremierMiles Card or UOB Privi Miles Card. In my younger days I used to have more than 10 credit cards across the various banks (oh the shame!). However as life grew busier, I realised it was not feasible to manage so many credit cards what with the different bank statements coming at different periods. Hence I would be hard pressed to apply for all the cards mentioned above unless I do not mind having to straddle between so many cards. I think that personally, I can manage 3 credit cards at most. Hence my personal recommendation would be to have ANZ Travel Visa Signature Card, Citibank Rewards Card (for shopping) and Maybank Horizon Visa Signature Card for restaurants, petrol and taxis. Why not the Standard Chartered Visa Infinite? This is because for anyone to obtain the high 1.4 air miles per $1 local spend, one would have to spend above $2,000 a month. Hence if you do not spend more than $2000 a month on your credit card and you do not travel too frequently, I would recommend the ANZ Travel Visa Signature Card. However if you do travel overseas frequently, I would highly recommend Citibank Premier Miles Card (instead of ANZ Travel Visa Signature Card) for daily use as they have 1.2 air miles per $1 local spend and 2 air miles per $1 overseas spend (compared to 1.4 air miles under the ANZ card). I think that Citibank Premier Miles hits the sweet spot if you do not want to always have to remember to hit a certain amount for redemption, and if you want a decent amount of air miles for local spend while having more air miles for overseas spend. 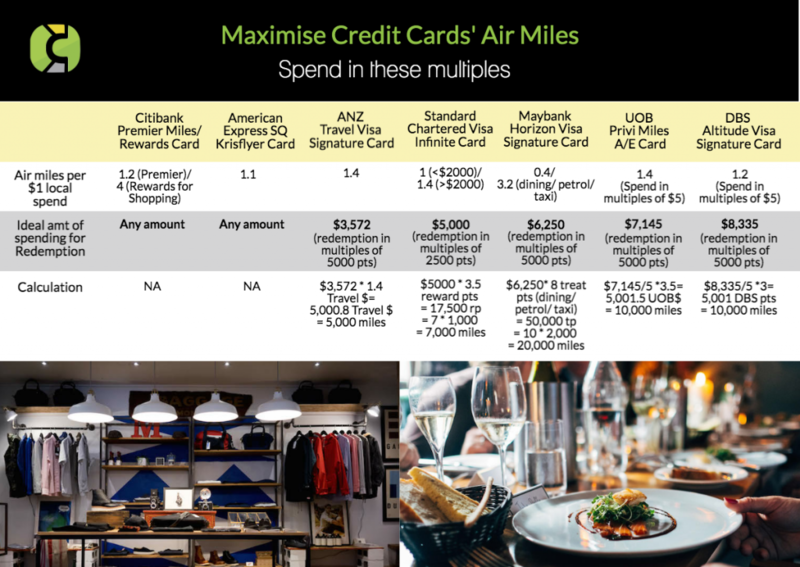 What do you think about the 6 ways to maximise your credit card air miles? Is it too mind-boggling? 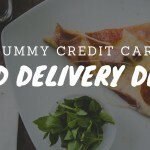 Do you think having 3-4 credit cards is a pain? If you had just one credit card to choose from, which would you choose? I’m interested to know! About the Writer: Lydia loves credit cards and air miles because they have brought her to Barcelona and Japan. As a result, she is passionate about educating friends and everyone else about how they can maximise their credit cards’ rewards. In her former life, she was a government servant who dealt with policies regarding social issues and businesses. Lydia is now a social entrepreneur involved in business development, and Children’s phonics and literacy. She lives in Singapore with a fluffy Sheltie named Lemon and a non-fluffy husband named Shuohan.